Of the 950 yachts racing at Skandia Cowes Week last summer, only one was referred to by her crew as "a bit of a weapon." This was fitting flattery, for Sir Peter Ogden’s Spirit of Jethou was exactly that, with her black hull, sleek coachroof, and carbon-fiber sails. Even so, after spending a day as part of her racing crew, I could find nothing menacing on board. 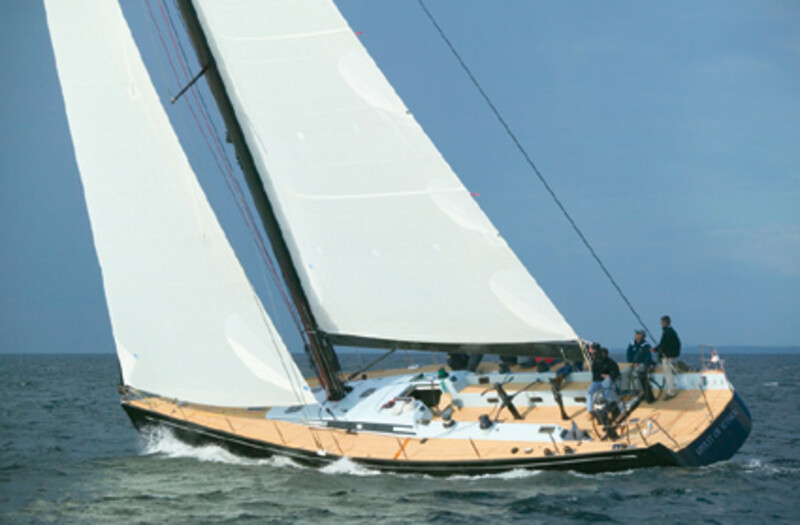 That’s because this German Frers–designed Swan 601 is just too sweet of line, too shapely in a lean sort of way, to be anything other than very elegant. She’s more a rapier than a broadsword, I would say. The yacht is the second model of Nautor’s more overtly race-oriented one-design classes and follows the similarly tautly styled and surfaced Swan 45. Ogden used to own a Swan 60, which he campaigned hard in England and abroad. His old 60 was a large-volume, high-freeboard, masthead-rigged yacht. In contrast, his new 601 is slippery and low and is powered by a towering fractional rig with blade jibs. Spirit of Jethou is precisely the sort of yacht you would buy if you could. And Ogden can, thanks to a career that went from Durham and Harvard Universities to Morgan Stanley and finally to Computercenter, the company he founded in 1981 and took public 16 years later. Ogden loves boats and sailing and has only one professional on board, skipper Stuart Branson. Ogden steers himself and prefers to race with friends, family, and a legend or two, such as 72-year-old Owen Parker, who was sailing master on all five of Edward Heath’s Morning Clouds. “Sailing is sociable, and I like it that way,” says Ogden. “I’ve had people on board who’ve said, ‘Why doesn’t someone else steer better?’ They don’t get asked back,” he says with a raucous laugh. Nautor has already sold six 601s, including Island Fling to noted Hong Kong accountant Paul Winklemann. “The yacht is a racer-cruiser—big A, big R, and a small C” is how Nautor UK’s Pat Lilley, another old Morning Cloud hand, likes to describe the new 601. It’s easy to see what he means. The deck, for example, is basically one long shallow trench. This makes it easy to race with a large crew because there are none of the usual obstacles to crossing the deck and cockpit during tacks. However, a bridgedeck option is available, and yachts with that configuration have a third head that can serve one of the two-berth aft cabins. The other configuration has a shared head for the after cabins. The forward master stateroom runs from the mast to the bow. There is a proper double bed with a headboard, though I suspect that most owners of these yachts won’t be spending too much time aboard other than for a brief family cruise after something like Antigua Sailing Week or the Rolex Swan World Cup at Porto Cervo in Sardinia. At this rather rarefied end of the market, most sleeping will occur aboard a mother ship or in a hotel or rented accommodation ashore. This is not to say the 601 lacks amenities or space, but these accommodations aren’t what attracts owners. It is also why there aren’t the vast banks of batteries, generous tankage, or washing machine often found on cruisier Swans. Owning a 601 is all about sailing, of course, and it’s hard to believe there are only six multi-function winches and one coffee-grinder on this yacht. Twenty-five years ago, the classic Frers-designed Swan 46 sported 18 winches. While the 601 may look like a beast, in fact she’s actually a very simple and well-laid-out yacht. And when it’s time for cruising, powerpacks can be plugged in to handle the mainsail, genoa, furler, and windlass. That has produced some compromises, of course, such as small jibs and simple mast controls. But like any performance sailboat, the 601 does require a lot of concentration from her helmsman and trimmers, all of whom must work together to keep the yacht from falling off her numbers. Building speed out of a tack or gybe, for example, requires a carefully coordinated effort. Construction utilizes full raceboat technology, and composite specialists at SP Technologies have acted as advisors on the project. Extensive use of carbon fiber throughout and the SPRINT resin-infusion system for the deck brought the first hull out of the mold at just 2,200 pounds. That&apos;s just 5 percent of the yacht&apos;s total sailing weight—and the sort of thing that will attract attention from potential performance-oriented owners. Judging from the reception thus far, it is well on its way to becoming another performance class, like its predecessor, the Swan 45. Tim Jeffery is SAIL&apos;s European correspondent.